A set meal plan helps you deflect your kids' cries for fast food and junky snacks. You'll streamline your shopping and ensure that your kids are exposed to a variety of foods. Design a meal plan that provides balance among the food groups and portion sizes appropriate for your kids' ages, sizes and activity levels. Four- to 5-year-olds generally need between 1,200 and 1,600 calories per day to stay at a healthy weight. A sedentary 6- to 8-year-old might need just 1,200 calories, but if he's very active, his energy needs might go up to 1,800 calories. Nine- to 17-year-olds need anywhere from 1,600 to 3,200 calories daily to support their energy needs -- depending on size and activity level. Larger, athletic kids should aim for the higher range. Each day in a seven-day meal plan should include a balance of foods to ensure adequate nutrient intake. If your child needs fewer calories, aim for the lower-serving range. A child needs between 4 and 10 ounces of grains -- half of which should be whole grains -- a day. Aim for at least 1 1/2 cups of veggies daily; kids who require more calories may consume as many as 4 cups daily. Weekly, you'll want to plan for at least 1 cup of dark green vegetables, 3 cups of red and orange vegetables, 1/2 cup of beans and peas, and 3 1/2 cups of starchy vegetables. Double these veggie servings for kids eating 3,200 calories per day. Just 1 to 2 1/2 cups of fruit per day suffices. Offer 1 1/2 to 2 1/2 cups of dairy foods daily to support growing bones. For proteins, like meats, fish and poultry, plan for between 3 and 7 ounces of lean protein, such as fish and poultry, daily. A healthy week's worth of meals includes breakfasts, such as whole-grain toast with nut butter and apple slices; oatmeal with berries and milk; scrambled eggs with diced bell pepper and 100 percent orange juice; or whole-grain pancakes with low-fat yogurt. Serve protein-filled hardboiled eggs with a whole-wheat bagel, or blend a smoothie using milk and frozen, unsweetened fruit. For a quick and easy meal, pour milk over whole-grain, low-sugar cereal. Lunches might include fresh turkey or roast beef on whole grain bread; low-sodium vegetable soup; a whole-grain pita with hummus; peanut butter on whole wheat bread with bananas; or low-fat cheese with whole-grain crackers. Serve carrot and celery sticks, grape tomatoes, a handful of grapes, low-fat yogurt or unsalted almonds on the side or as snacks. Skip soda and juice drinks -- serve water instead. For dinner, transform kid-friendly favorites to fit your healthy plan. Make pizza with a whole-wheat crust and top with veggies and low-fat cheese. Add steamed broccoli to whole-wheat spaghetti; Grill, instead of fry, chicken and serve with a baked potato topped with mild salsa. Wrap lean seared flank steak in a whole-wheat tortilla, and offer avocado dip and baked chips on the side. For burgers, use lean ground turkey or beef and serve in a whole-wheat bun, alongside cut-up veggies instead of fries. Sit down as a family to plan the week's meals. You'll have more buy-in if the kids help decide what healthy foods will appear on their plates. Have the kids write a shopping list that you stick to once you get to the store. Don't be tempted to stray from your list to buy the chips or sugary drinks that are on sale. 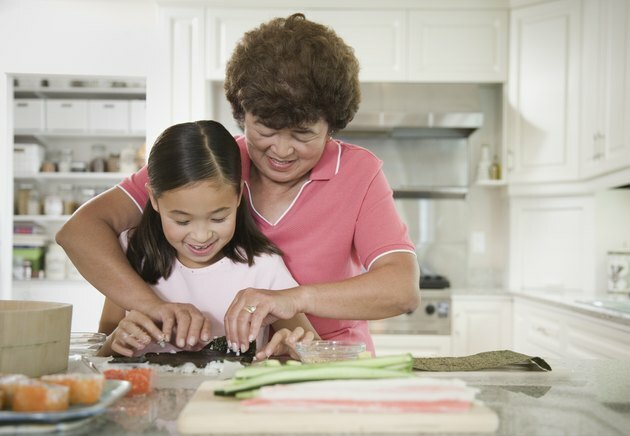 Involve your kids in the preparation of meals, too. You'll teach them what healthy food and proper portions look like, and give them the cooking skills they'll need to eat well when they're on their own.